Barbara Mikulski: The Senate Appropriations chair that could. 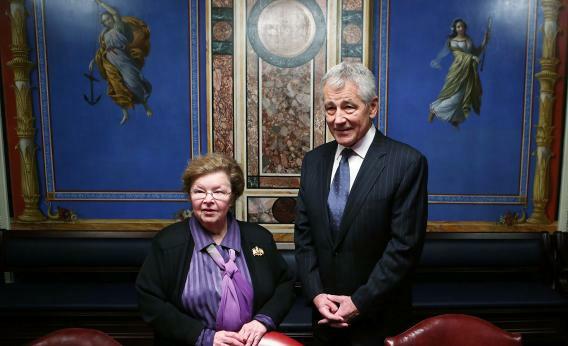 U.S. Senate Appropriations Committee Chairman Barbara Mikulski (D-MD) meets with U.S. Secretary of Defense Chuck Hagel on February 7, 2013 in Washington, DC. I’ve got a new piece up that wraps the long national nightmare over the Continuing Resolution—the thing that prevented a government shutdown—by profiling Maryland Sen. Barbara Mikulski, new chair of the Senate Appropriations Committee. She took over the committee upon the death of beloved Sen. Daniel Inouye, after two more senior Democrats passed on it. But nobody ever passes on running Approps! The Mikulski ascension looked to be proof that moving money around had truly lost its luster and clout. And then this 4’11” woman came in and got more out of the CR than liberals thought they could. There’s no real counterpoint in the story; if there were, it would ask whether Mikulski should have fought harder for a CR that restored all of the pre-sequestration cuts. Problem was, the White House didn’t want that. And that’s sort of my point. For all the flash of the White House briefing room and the buzz of Tea Party filibusters, the old-fashioned ball-busting of a legislator who hangs out and negotiates for two weeks can still win out. Correction, March 21, 2013: This post originally misspelled Sen. Daniel Inouye’s last name.